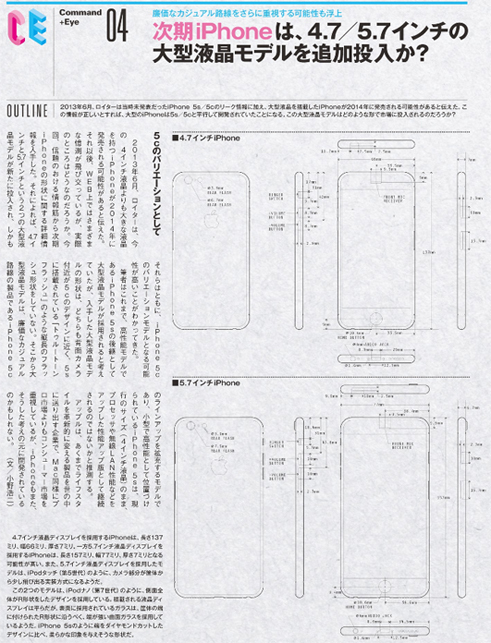 Long-running Japanese magazine MacFan has published alleged drawings of what appear to be 4.7-inch and 5.7-inch iPhone 6c models in its latest issue, reports Mac Otakara [Google Translate]. The images appear to show a flat, bezel-free device with rectangle-shaped volume controls like those found on the current iPhone 5c, as well as a camera with a single LED-flash on the rear. While the validity of the drawings are unknown, iPhone 6 rumors have suggested that Apple will continue with the dual iPhone strategy, producing the iPhone 6 in two different sizes. 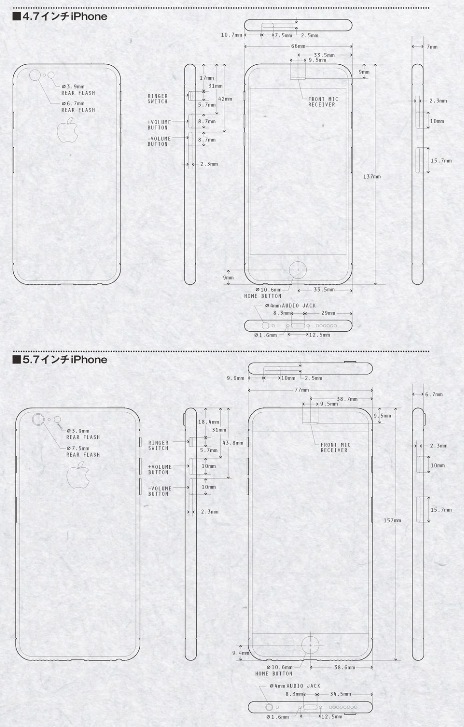 The most recent report from Japanese newspaper Nikkei said that the iPhone 6 could launch "as early as September" in 4.7-inch and 5.5-inch sizes. Other reports have suggested that Apple will cease the production of a plastic iPhone in favor of using metal casings for both phones. Update 6:28 AM: Here is a slightly higher resolution version of the drawings, showing the smaller model to measure what appears to be 137x66 mm and 7.0 mm thick. The larger model appears to be 157x77 mm and just 6.7 mm thick, with that thinner body requiring that that the rear camera protrude somewhat as on the current iPod touch. Tim is out of ideas. Things like this keep getting brought up--and I wish that people could understand that certain mediums have their limitations. Boil down the modern-day smartphone to the basics: it's typically a rectangular object with a screen. From that point forward, everything else is optional. Camera, Fingerprint Sensor, 9DOF Capabilities, Resolution of the screen... the wild frontier that smartphones once were is not the same landscape that exists today. I can come up with some wizbang thoughts of my own for where phones should go, but a lot of them just leverage the software to do cool things. As far as the next iPhone goes, the rumors about a bigger screen are par for the course, and why can't that be okay? A bigger screen with an even higher resolution would essentially put apple at hardware-feature-parity with other manufacturers. Then it boils down to an "experience" game--how does holding the phone make you feel? How does using the phone make you feel? Look at any other industry that matures--this is how things go. The essentials eventually sift out and it boils down to preference. I would argue its a bit premature to say Tim is out of ideas, or smartphone manufacturers in general are out of ideas. This specific medium has matured. If you are looking for "oh wow, I've never even thought of this before!" kind of moments, then keep your eyes peeled for what Virtual Reality, Smartwatches, Motion Control, and other mediums bring to the table--because these are still "wild frontier" where anything is still possible. Some of them might die off, some of them might succeed, who knows, but that's where the new "cool" is. That's where the ideas are, and rightfully so. Apple is clearly winning the secrecy battle here. No one seems to know what the hell is going on with this phone. Kind of old school, but here's the dimension comparison based on this articles numbers (see attachment). The larger model is downright huge. The problem with opinions like yours is that some people tend to think they're true , which I can't even begin to explain how I feel about close minded ,quick jumping , opinions that think they know what innovation is and yet they sit on a sofa self employed as an arm chair CEO . Mactendo is out of ideas. I just asked my girlfriend which size she'd prefer - 4 inches or 5,7 inches. Turns out she's more into tablet form factor, she likes 8 inches.